Again, this is useful information but it is not all there is to know on the topic. Back to our synth and the types of waveform options that are available. 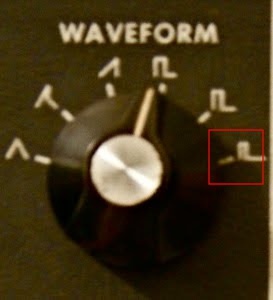 Each Oscillator has a waveform knob. Each waveform has 6 different ways to adjust the harmonic content. The Triangle waveform only contains odd numbered harmonics at the low end. This is a good choice for creating soft sounds. This is a hybrid of the Sawtooth and Triangle waveform. It has more harmonic energy than the triangle and offers even-numbered harmonics. The sawtooth triangle has more edge to the sound but remains clear. The Sawtooth is the most harmonically dense. Creating thick and brassy sounds the sawtooth can produce powerful leads and is also good for bass sounds. The Pulse Square contains only odd-numbered harmonics The square creates a rich starting point for strings while the pulse is based on the width of the top half in relation to the bottom half of the waveform. The Pulse Wide Rectangle. The more the square changes to a rectangle the more even-numbered harmonics are added. This is good for creating hollow sounds. The Pulse Narrow Rectangle As the pulse rectangle is narrowed lower number harmonics, both odd and even numbered, are added. This applies a more nasally sound. The mixer sets the volume level of all 5 audio sources. The 3 oscillators, the external audio source, and the noise generator. The combined output of the mixer then will pass through the filter then finally reach the audio output. In addition, a volume switch is present for quick access to cut a signal completely on or off. The Noise control can be Incorporated or used alone to create sounds like a rocket launch. White noise will generate things like TV static while Pink noise will deliver more percussive crashes. “There is a switch on the synth for an external input. In a real Minimoog, this could receive any audio input,but for this plug-in, it has been hardwired as a feedback loop from the audio output of the synth. Be careful pushing the volume of it too high!” – A note from the plugin creator. The 3 switches between sections are filter modulation and keyboard control 1 & 2. When this switch is on the filter cutoff frequency can be modulated by the noise generator, filter contour, and oscillator 3. 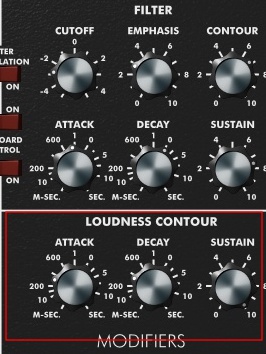 The modulation source and amount are defined by the controllers setting. Keyboard control 1 & 2. This allows notes played higher to be brighter. Control 1 provides 1/3 of the total amount. Controller 2 provides 2/3. Combining the 2 provide 1. This is where all filtering and modifications occur. There are 6 ways to filter and 3 when determining loudness. 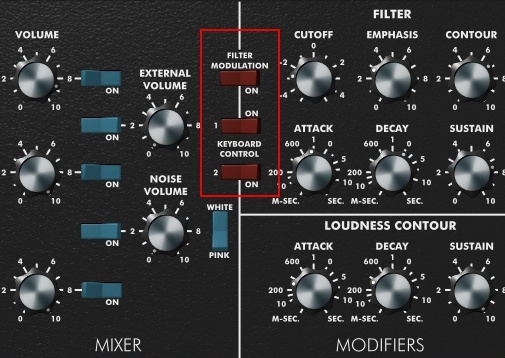 The filter modifies the harmonic content of the sound. When a note is played the harmonic occurring above the filter is cut off. Harmonic content occurring below the cut off filter is allowed to pass through. When closing the filter by cutting off the amount Lowering the cutoff filter the sound will come across dark and growling. Emphasis, in this case, is reconsidered resonance, taking some of the output signals and returning it into the input filter. The contour section is where you add articulation to the sound. One option changes the cut off frequency over time and the other option controls loudness over time. Sets the time control for the filter cutoff. This determines how much time passes until the cutoff filter engages. Sets the time required for the filter cutoff frequency from the level achieved by the attack stage to the sustain. Will hold the filter cutoff frequency at the level determined as long as the note is held. duration of a sound, have it ascend or descend at any given rate. Sets the time required to raise the volume from zero to its maximum level once a key is pressed. Sets the time required to lower the volume from its maximum level achieved by the attack. Will hold the volume for as long the note is held. The output section controls the final mix signal strength. A reference tone in the key of A at 440Hz. And there you have it. 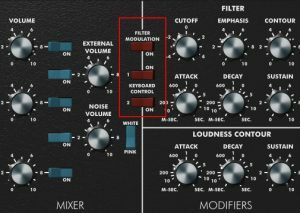 A breakdown of the functions of a Mini Moog Synthesizer. Now let us take another look at the interface as a whole. Taking another look it doesn’t seem as baffling as it did before. 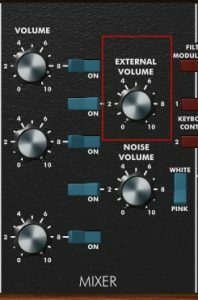 With some basic knowledge of key functions, you should be able to approach any synthesizer without fear or hesitation and be able to generate a tone, tune it and modify it. The rest is all experimentation and customizing your sound. There is a PDF book available that will show you the settings on how to obtain certain sounds as well as some of the settings used by the pros, it is free and available to download here. You can pick up a real Minimoog ranging from $2000 all the way up to $9000. While playing around with the VST version if you come up with any cool sounds be sure to save the preset and share the settings in the comment section below.